Well, look at me posting again so soon! Maybe I have this semi-down-pat! Anyway, I'm super excited about a few things accomplished this first month of 2016! A couple of weeks ago I went on quilt retreat with my usual friends. LindaLee always puts on a good retreat! Unfortunately I had poorly packed for getting much accomplished but I did get this finished and it is well before Easter!! I've been really trying to get organized and back on track with the Farmer's Wife Sampler Quilt. I made a list of all the pieced blocks I still need to piece and I printed off the foundation paper-pieced patterns that are still on the to-do list. I even cut out 2 blocks for paper-piecing. I plan on taking those to work on during Saturday quilt-togethers. How smart am I???? Ha! 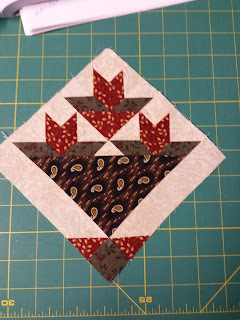 In the meantime, I sewed this Lily block that was FPP but not sewn together. Not too bad considering it took me (from start to finish) about 3 weeks. Incredibly lame!!! It finishes at 6" square. My proudest moment has to be this next one. It is the first UFO that was designated to be completed this year on All People Quilt UFO Challenge . 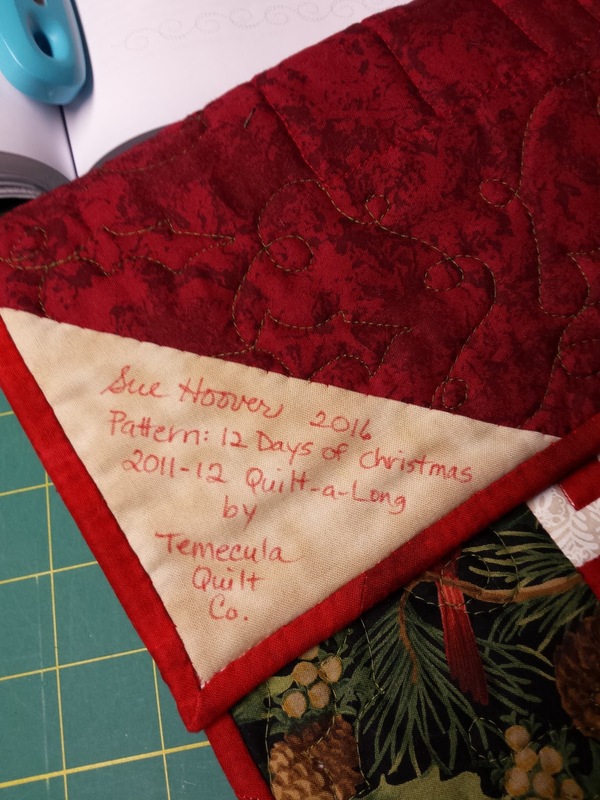 It was a Quilt-a-Long with Temecula Quilt Company called "The 12 Days of Christmas". The first block has 1 piece, the 2nd block has 2 pieces, ..., all the way down to the last block has 12 pieces! Cute idea, huh? All I had left to do was sandwich it, "quilt as desired", and bind it! Ta! Da! Even labeled!!! BONUS for me!!! All I have planned for the remainder of this month is to get my Pavo Slipper Socks finished today. It was a January Challenge from The Loopy Ewe. I forget the reason but they chose Pluto for this month so we were to knit something that had a P in it ... could be the pattern, the yarn type, the color, whatever. Just make sure there was a P involved. I've knitted these slippers before and they are the MOST COMFY!! And quick!!! Picture to follow ... I've got some knitting to get done today! I hope your January went well. I'm looking forward to the extra day in February this year! At Long Last I Have Found You!! Oh my gosh! I spent almost 2 hours trying to find my blog the other day and couldn't!!! All of a sudden yesterday, as I was browsing online, I discovered I may have been signed in under a different account. Checked into it today and Ta! Da! here I am!!! I will start with All People Quilt UFO Challenge. Consequently, it may also be all I accomplish today as we have recently added a puppy to our family. More on her another day. Project #1: A Quilt-a-Long with The Woolen Willow. I believe it was 2014. I'm only missing a 5-Flying-Geese section, a 7-Flying-Geese section, and four Star cornerstones. Well, that and assembly, of course. 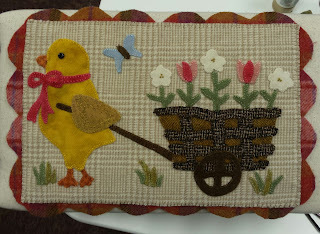 I loved following along with this wool & cotton applique project and REALLY want to get it finished! Project #2: This was another Quilt-a-Long but with Temecula Quilts. It was called "The 12 Days of Christmas" and I didn't understand the title until about day 10. Each block had successively more & more pieces. For example, day one had one piece; day two had two pieces, ..., all the way to the twelfth day had 12 tiny pieces. By far the hardest for me was day eleven! (The blocks finished at 3" = TINY!!!!) All that's left to do on this one is get it quilted & bound. Project #3: This project was started last year in a class taught by Lisa Grossenheider through my wonderful guild. If you're a quilter and haven't joined a guild yet ... DO IT!!! You will learn so much and have so many opportunities to learn even more! 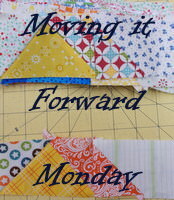 I have 3 blocks finished, 1 block started, and oodles of fabric cut and ready to move on. Let's do it! Project #4: This was a Sew-a-Long with Red Brolly. I love my embroidered blocks but I am most definitely NOT in love with my piecing fabrics. I have a fabric that I based my embroidery threads and then the cotton fabrics but it turned out kind of yucky. When this number gets called up, I will be removing the cotton and keeping it simple by sewing sashing with the fabric it was designed to go with. It was a color-fail on my part but it can be made right! Project #5: I Love, Love, Love this project. Another project started through a class in my guild. This one was taught by Lynn Hagemeier from Moda's Kansas Troubles. Lynn teaches an easy method she calls Layers of Love. Her book of the same title has this project in it. I have a pieced border to sew together (fabrics are already cut) and then add on and voile! DONE! Project #6: I won a Kansas Troubles Layer Cake and made Project #10. This table runner was made with the scraps. All that's needed here, I believe, is a border and quilting! Should be a piece of cake! Project #7: This project was from a pattern that I fell in love with by Edyta Sitar called "Dresden Star". The fabrics in this "masterpiece" were from a Retreat Challenge a couple of years ago. I loved making the blocks, I love the fabrics us retreaters chose, the only problem was I couldn't compete in the challenge because 1) I used all but one fabric and we had to use ALL, and 2) it obviously wasn't finished on time. All that's needed is to sew the rows together, add side triangles and borders! Project #9: This is my dream project ... I've had the pattern for a little while now and would absolutely love to make this. Maybe a good start can be made in 2016! Isn't it beautiful???!!! Project #10: This is a pattern by Gudrun Erla called "Hugs and Kisses", (I think). Let me interject that if you ever have a chance to take a class by Gudrun, do it! She is so nice and wonderful! You'll love her like I did, I'm sure! 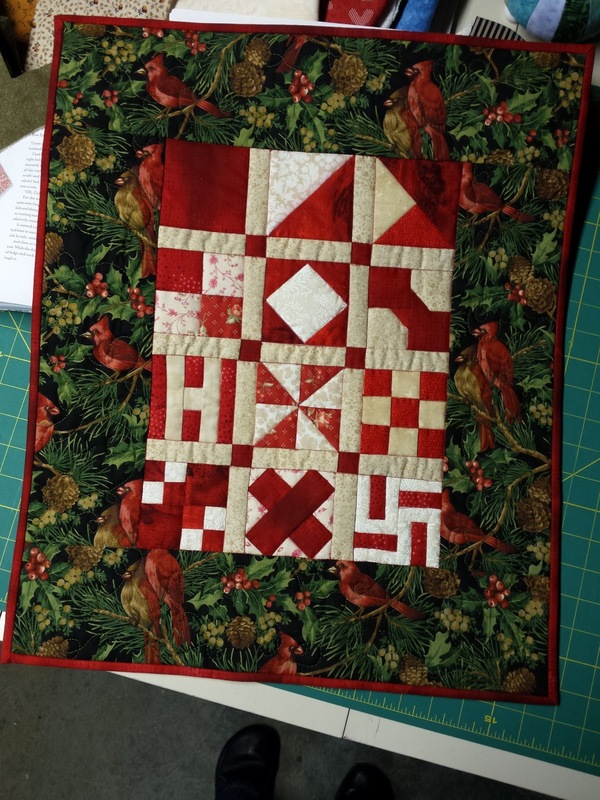 This project was from one of her books and I used a Kansas Troubles Layer Cake that I won and talked about in Project #6. Project #11: This is my guild's 2015-16 Block-of-the-Month. We received our last flower block last night and will receive the last bird pattern in February. The top must be completed by April guild meeting. I'd like to see the entire quilt completed by year end! Am I dreaming???? Project #12: At the 2015 March Kinderhook Retreat, I picked up these fabrics to quickly put together a quilt for in the car. It is meant to be super easy because it, after all, will be in the car! Duh! It was so funny because when I told my sister and my friend, Molly, about my idea, they also bought the fabrics. Wonder if theirs are done or merely waiting like mine? OK, so there you have it. I will try to be better at this but no promises!